From June 27 to July 7, 2013, the cities of Tijuana and Mexicali in Mexico will take centre stage when they hold the 13th edition of the Boys' Under 19 World Championship This is the second time, since 2007, that the cities have been afforded the opportunity to host the event which was followed by the Women's U20 World Championship in 2009. The Sports and Physical Culture Institute of the State of Baja California that will be supporting the organisation of this year's tournament is no stranger to organising sporting events, having also hosted 10 editions of the Pan American Cup, both at youth and senior level, as well as two Olympic Qualification Tournaments and several NORCECA continental events. The two cities are a 150km apart and are located in the far northwest of Mexico close to the US border. Founded in 1889, Tijuana has grown to a population of almost two million. It is the second largest city on the Pacific coast after Los Angeles and is fast developing a dynamic arts and sport scene. Enterprising newcomers have breathed life into the city’s restaurant industry, using cultural institutions like Centro Cultural Tijuana (CECUT) as a breeding ground for home-grown artistic and cultural movements. Founded in 1909 by immigrants working in the cotton industry, Mexicali is now the capital of the state of Baja California. The city received its name from a combination of ‘Mexico’ and ‘California’ as it shares its border with the town of Calexico (from ‘California’ and ‘Mexico’) in California, USA. It is not surprising that Mexicali is often referred to as ‘The city that captured the sun’ as during the summer, temperatures can range between 35ºC to 45ºC. Primarily an agricultural town, the population of 856,000 work primarily in foreign manufacturing facilities called ‘maquiladoras’. 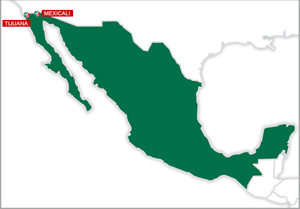 Owing to Mexicali’s proximity to the US border, it is also an important hub for trade and commerce. The competition will take place at the High Performance Sports Center of Baja California, also known as CAR. It is one of the most important sports facilities in Mexico. The competition will take place at the Auditorio del Estado.